We’d like to start of the new year by recognizing one of our most established volunteers here at the Aquarium. Having served more than 3,000 hours over the past 25 years, Noel is an Aquarium mainstay. 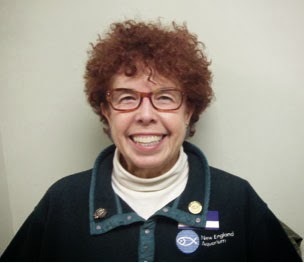 As you’ll read in her supervisor’s nomination, Noel represents the values of the New England Aquarium volunteer community through the support and dedication she provides to other volunteers, interns, staff and our institution. Noel Jette epitomizes all the best in an Aquarium Guide. She is articulate, knowledgeable and willing to attempt new challenges. She is a superb interpreter and an invaluable mentor of other volunteers (myself included) and interns. She exceeds expectations, both in terms of the quality of her communications with our visitors, but also in terms of her time commitment (she has donated her time since 1989!). Most importantly, Noel is passionate about her work here and about the mission of the Aquarium. Congratulations Noel, and thank you for your continued contributions to our community!